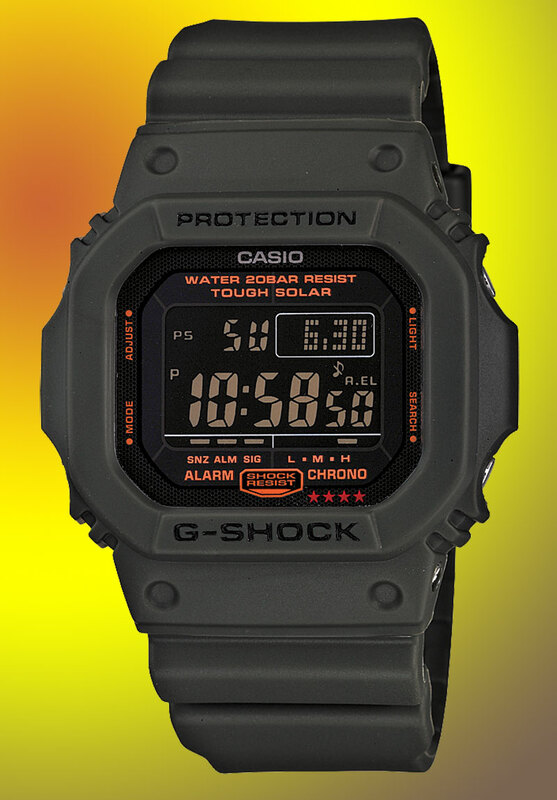 Casio America, Inc. has announced the coming release the Solar Military Green G-Shock collection comprised of three signature styles in a matte olive green. The GR7900KG-3, G5600KG-3 and G6900KG-3 timepieces are the G-Shock’s brand ethos of rugged toughness in well established form-factor watches with the introduction of a new color option. 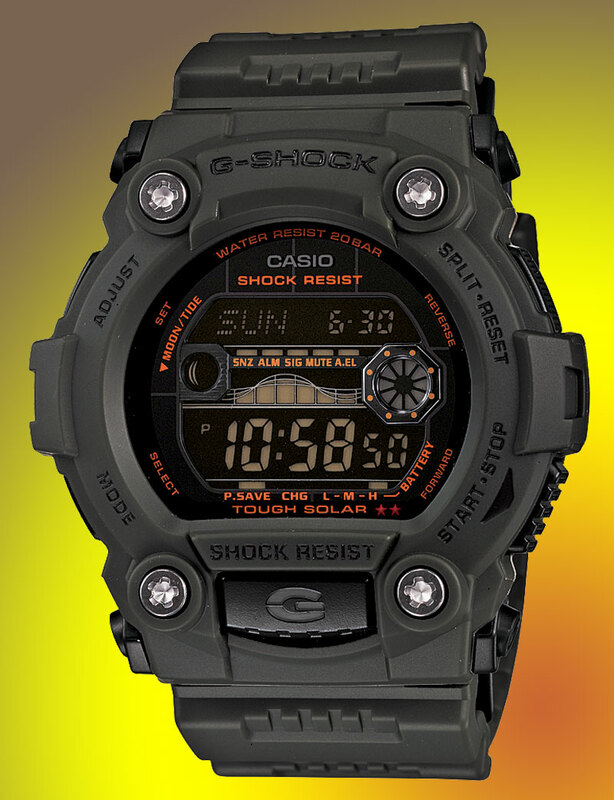 The G-Shock Solar Military series features shock resistance, 200M water resistance, full auto EL backlight, world time (48 cities + UTC), 4 daily alarms and 1 snooze, 1/100th second stopwatch, countdown timer, 12/24 Hr formats and mute function. Encapsulated in a resin case with a four point bezel protection design with exposed metal screws; the GR7900KG has all of the above features in addition to tide/moon graph & data. Each watch in the series has a unique case shape making them similar but different; each style defined by the wearer’s preference of square, round or oval. Pictures can be enlarged by clicking anywhere on the image. The special benefit of solar charging, a great convenience in a watch that you don’t want to ever have to change batteries for, is that you never run the risk of losing the factory perfect water seal. 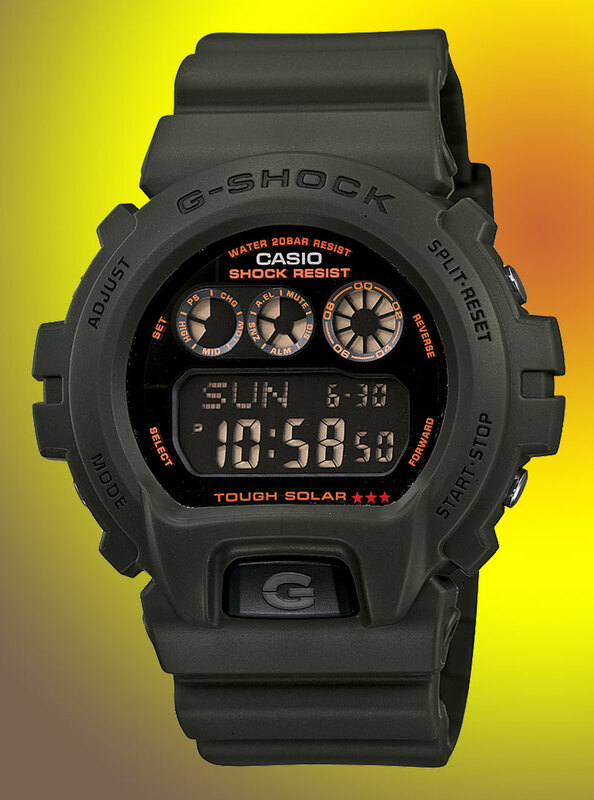 The Solar Military Green collection of mens watches will be available in April 2012 for $120 at Bloomingdales, Lord & Taylor, Macys, Tourneau, fashion boutiques and discerning jewelers as well as http://www.gshock.com. There was no indication in the announcement as to the number of watches that will be released in the edition. So, again, this blog recommends that if you like the look and want one of these, you might want to make the move when they become available. G-Shock buyers have learned the hard way – never take for granted that any watch model will be around indefinitely. Note: In answer to a couple e-mails I’ve received, let me point out that the recently released Japanese edition of Army Green (..KG-3..) watches, of which there are five models (GW-M5610KG-3JF, GXW-56KG-3JF (not yet announced), GW-6900KG-3JF, GW-7900KG-3JF, AWG-M500KG-3AJF), have an additional feature: atomic self-time-setting. And, oddly, there is no indication that the solar-only models that we will see here soon will be sold in Japan.